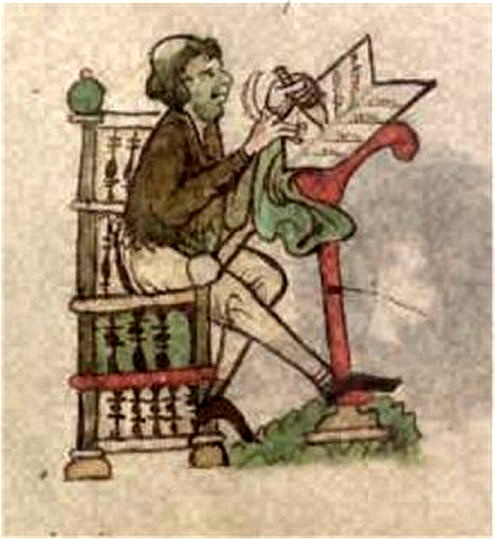 In early Christian Ireland books were written by hand in the monasteries of the time. They were beautifully written and lavishly illustrated with intricate but minute designs. Some, such as the Book of Kells, have survived the centuries but others have been lost. One such lost book is the Book of Kildare. How do we know there was such a book? Well, it was seen and marveled at by the Norman scribe, Giraldus Cambrensis, when he came to Ireland and Kildare in 1185, a few years after the coming of the Normans. Here is his account of the Book of Kildare as written in his book Topographia Hiberniae over 800 years ago. Among all the miracles of Kildare nothing seems to me more miraculous than that wonderful book which they say was written at the dictation of an angel during the lifetime of the virgin. This book contains the concordance of the four gospels according to Saint Jerome, with almost as many drawings as pages, and all of them in marvellous colours. Here you can look upon the face of the divine majesty drawn in a miraculous way; here too upon the mystical representations of the Evangelists, now having six, now four, and now two, wings. Here you will see the eagle; there the calf. Here the face of a man; there that of a lion. And there are almost innumerable other drawings. If you look at them carelessly and casually and not too closely, you may judge them to be mere daubs rather than careful compositions. You will see nothing subtle where everything is subtle. But if you take the trouble to look very closely, and penetrate with your eyes to the secrets of the artistry, you will notice such intricacies, so delicate and subtle, so close together and well knitted, so involved and bound together, and so fresh still in their colourings that you will not hesitate to declare that all these things must have been the result of the work, not of men, but of angels. On the night before the day on which the scribe was to begin the book, an angel stood beside him in his sleep and showed him a drawing made on a tablet which he carried in his hand, and said to him: “Do you think that you can make this drawing on the first page of the book that you are about to begin?” The scribe, not feeling that he was capable of an art so subtle, and trusting little in his knowledge of something almost unknown and very unusual, replied: “No.” The angel said to him: “Tomorrow tell your lady, so that she may pour forth prayers for you to the Lord, that he may open both your bodily and mental eyes so as to see the more keenly and understand the more subtly, and may direct your hands to draw correctly.” All this was done, and on the following night the angel came again and held before him the same and many other drawings. By the help of the divine grace, the scribe, taking particular notice of them all, and faithfully committing them to his memory, was able to reproduce them exactly in the suitable places in the book. And so with the angel indicating the designs, Brigid praying, and the scribe imitating, that book was composed. In the past there was some speculation that the Book of Kells is the book described by Giraldus and that it should really be named the Book of Kildare. Modern research would seem to indicate that this is not so, but there is no doubt from the above description that the two books were very similar.